On a recent local flight, something attracted by attention. As the flight attendant was passing with a trolley of drinks and snacks, a passenger seated in front of me enthusiastically ordered a can of beer and a packet of nuts. As the flight attendant passed the order to the passenger, he told him that the bill for the two items was KES.600. The passenger quickly returned the order. What I thought is that he did not know that the order comes with a bill. He probably thought that they were free like in many other airlines. As I thought about what had just unfolded, my mind took me to another level of thinking. I started thinking of the many things that I have picked just because they were offered to me for free. Think of the many sweets(candy) that you have eaten in conferences or meetings just because they were placed in a bowl in front of you. How about the drinks and bitings in cocktails or the sweet ‘change’ that you get in supermarkets that has become part of the Kenyan culture or even the ‘gift’ sweets that you get in some shops as an appreciation of your purchase. The flight incident made me remember social events that I have attended where some people really overdo themselves with drinks simply because they are free. I am even remembering witnessing another two passengers in an international flight who kept asking for the free in-flight beer. With a sense of entitlement, they drunk too much to an extent that they became a nuisance to those around them. While it is good to accept and partake of things that are given to us, such ‘gifts’ should be well considered especially if you are consuming them into your system. As we seek to take greater control of our health and of our destiny as such, I have started realizing that one must exercise the power of choice as opposed to loosing control to the many offers at hand. 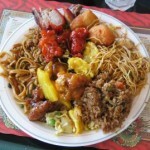 As one goes through the meandering food buffet for example, it is critical that one does not look at the varied choice as something to conquer but take a moment to remember what an over-flowing plate twice or thrice a week can do to their body in five or ten years. As you read this article, I bet you could be asking, what harm does it do to spoil yourself once in a while? Well the question is how often is your once in a while? If you cannot help yourself from such indulgences majority of the times, chances are that your level of discipline requires strengthening. Your will to resist sweet temptations and keep focused to your active ability to choose what you will pick from unwinding array of choice is a discipline that will help you succeed in achieving your goals. I can almost bet that the drifts in your discipline are not isolated to one area only. My experience is that if you lack food discipline, chances are that you will not exercise discipline in keeping to a regular fitness programme, or saving or investing or even returning calls. Neither will you be able to keep your main thing your main thing. Secondary things will always sidetrack you and make you loose focus. As you reflect on these things, next time you come across offers such as bottom-less soft drink, or a bowl of candy is placed in front you, or an array of deserts call your name, remember that you are the one who is in-charge here. The decision to pick or not and if yes, how many/much, squarely lies with you. You are under no obligation to consume something simply because it is available to you for free. The free might turn expensive a couple of years down the road. Mukami ‘Khami’ Chege is seasoned and inspiring Conference Speaker and Moderator with vast experience in communications, business strategy, organizational development, management and leadership. She has great passion for personal and organizational success, empowering young people for leadership and making a positive contribution to society. She is an inspiring motivational speaker, mentor and a coach. She is a member of Public Relations Society of Kenya, Professional Trainers Association of Kenya and a full member of the Kenya Institute of Management. Mukami holds a Bachelor’s Degree in Education, Masters in Communication Studies, and an MBA all from the University of Nairobi. She started her career as Radio Presenter and has worked with various organizations rising to the level of an Executive Director.